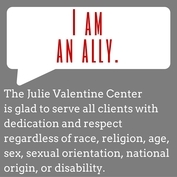 Our services have expanded and adapted to meet the needs of clients over the years, however, our overall mission to advocate for victims of sexual violence has been unwavering. Through re-branding, location changes, and over 40 years of service we have maintained our earnest desire to be the voice for sexual assault and child abuse victims in Greenville county. Our staff is comprised of over 20 dedicated professionals. Our combined experience and education includes multiple licensed therapists and decades of experience working with victims of sexual assault and child abuse.